Boho Embroidery is back! Following Nichole Vogelsinger's best-selling Boho Embroidery: The Pattern Collection continues Nichole's signature fabric-collage-meets-embroidery journey featuring all new designs, stitches and techniques. Boho Embroidery is back! Following Nichole Vogelsinger's best-selling Boho Embroidery: The Pattern Collection continues Nichole's signature fabric-collage-meets-embroidery journey featuring all new designs, stitches and techniques. Love her signature style but struggle to create your own collages? This is the answer with over 30 original motifs you can transfer right out of the book. Immerse yourself in Nichole's Boho style with saturated threads and fabric and shimmery beads and sequins. Nichole provides over 30 original motifs all ready to transfer to their own fabric and get stitching! 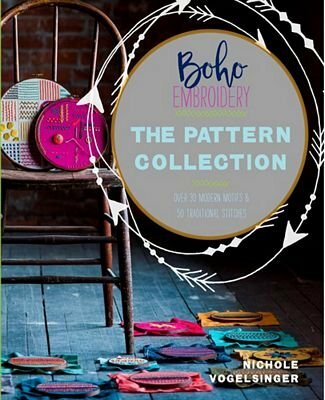 Boho Embroidery: The Pattern Collection includes instructions for 15 new embroidery stitches and discusses how to use color and neutral shades effectively. The author then gives tips about where to find inspiration, and teaches how to create hoops for effective embroidery. There are 10 different projects ranging from linens to hair clips to buttons-all projects show practical ways to embellish with her signature embroidery and applique style. The book wraps up with Nichole's suggestions on how to explore your own creativity with pattern suggestions for making your own hoops or accessories. Softcover, 128 Pages. Author: Nichole Vogelsinger.